Hello my lovely readers! It's been a whirlwind of a couple of weeks. I made it to Scottsdale safely (driving from Washington to Arizona is a looooong and boring drive, let me tell you). Anyway, I am trying to settle in by adjusting to the heat (it's 96 right now at 7:08 p.m.), job hunting, and catching up on my nail art endeavors. I'm so sorry that I was so sporadic in my posts, but with my final semester in college, my graduation, and the move…things were bound to get a little hectic. I want to thank you all for sticking around. I hope to get this blog on a roll again now that I will have more time (and hopefully a regular schedule once I find a job). 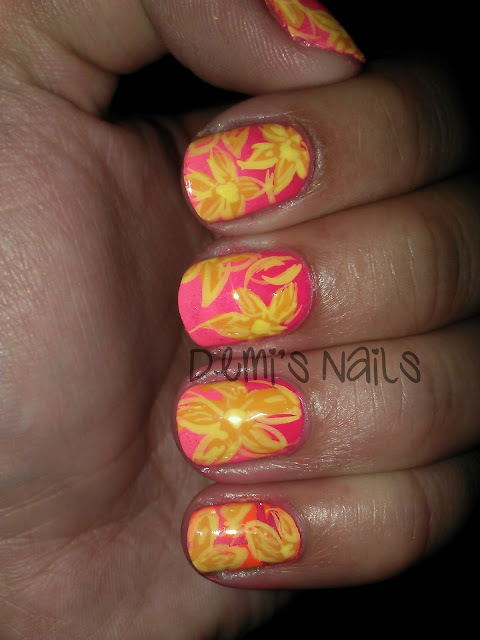 To kick off my return to blogging, I am doing "7 Days of Pink, Orange, and Yellow" manicures! Let's get started with the first day! 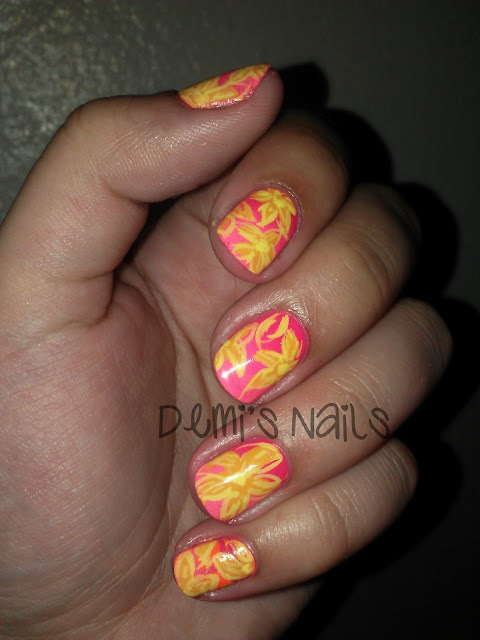 I wanted something floral and happy, so I did a dark and light pink gradient, then randomly placed orange flowers on my nails. I used a thin brush and some thinned out yellow to outline the flowers. Overall, it was a quick and messy manicure, but I really enjoyed the cute flowers and the vibrance of the colors! Stick around for day two!